I met someone last week who said her employer — a large integrated oil & gas company — 'owned her'. She said she'd signed an employment agreement that unequivocally spelt this out. This person was certainly a professional on paper, with a graduate degree and plenty of experience. But the company had, perhaps unwittingly, robbed her of her professional independence and self-determination. What a thing to lose. Agreements like this erode our profession. Do not sign agreements like this. The idea that a corporation can own a person is obviously ludicrous — I'm certain she didn't mean it literally. But I think lots of people feel confined by their employment. For some reason, it's acceptable to gossip and whisper over coffee, but talking in any public way about our work is uncomfortable for some people. This needs to change. Your employer owns your products. They pay you for concerted effort on things they need, and to have their socks knocked off occasionally. But they don't own your creativity, judgment, insight, and ideas — the things that make you a professional. They own their data, and their tools, and their processes, but they don't own the people or the intellects that created them. And they can't — or shouldn't be able to — stop you from going out into the world and being an active, engaged professional, free to exerise and discuss our science with whomever you like. If you're asked to sign something saying you can't talk at meetings, write about your work, or contribute to open projects like SEGwiki — stop. 1. Knock someone's socks off. That's it. That's my goal. I know it's completely stupid. It's not SMART: specific, measurable, attainable, realistic, or timely. I don't believe in SMART. For a start, it's obviously a backronym. That's why there's attainable and realistic in there—what's the difference? They're equally depressing and uninspiring. Measurable, attainable goals are easy, and I'm going to do them anyway: it's called work. It's the corporate equivalent of saying my goals for the day are waking up, getting out of bed, having a shower, making a list of attainable goals... Maybe those are goals if you're in rehab, but if you're a person with a job or a family they're just part of being a person. I don't mean we should not make plans and share lists of tasks to help get stuff done. It's important to have everyone working at least occasionally in concert. In my experience people tend to do this anyway, but there's no harm in writing them down for everyone to see. Managers can handle this, and everyone should read them. Why do these goals seem so dry? You love geoscience or engineering or whatever you do. That's a given. (If you don't, for goodness's sake save yourself.) But people keep making you do boring stuff that you don't like or aren't much good at and there's no time left for the awesomeness you are ready to unleash, if only there was more time, if someone would just ask. You are not paid to be at work, or really to do your job. Your line manager might think this way, because that's how hierarchical management works: it's essentially a system of passing goals and responsiblities down to the workforce. A nameless, interchangeable workforce. But what the executives and shareholders of your company really want from you, what they really pay you for, is Something Amazing. They don't know what it is, or what you're capable of — that's your job. Your job is to systematically hunt and break and try and build until you find the golden insight, the new play, the better way. The real challenge is how you fit the boring stuff alongside this, not the other way around. Knock someone's socks off, then knock them back on again with these seismic beauties.Few managers will ever come to you and say, "If you think there's something around here you can transform into the most awesome thing I've ever seen, go ahead and spend some time on it." You will never get permission to take risks, commit to something daring, and enjoy yourself. But secretly, everyone around you is dying to have their socks knocked right off. Every day they sadly go home with their socks firmly on: nothing awesome today. I guarantee that, in the process of trying to do something no-one has ever done or thought of before, you will still get the boring bits of your job done. The irony is that no-one will notice, because they're blinded by the awesome thing no-one asked you for. And their socks have been knocked off. That's how scientists think, right? Logical, deductive, objective, algorithmic. Put in such stark terms, this may seem over the top, but I think scientists do secretly think of themselves this way. Our skepticism makes us immune to the fanciful, emotional, naïvetés that normal people believe. You can't fool a scientist! Except of course you can. Just like everyone else, scientists' intuition is flawed, infested with bias like subjectivity and the irresistible need to seek confirmation of hypotheses. I say 'everyone', but perhaps scientists are biased in obscure, profound ways that non-specialists are not. A scary thought. ...as if there is but one method. To see how wrong this notion is, stop and try to write down how your own investigations proceed. The usual recipe is something like: question, hypothesis, experiment, adjust hypothesis, iterate, and conclude with a new theory. Now look at your list and ask yourself if that's really how it goes. If it isn't really full of false leads, failed experiments, random shots in the dark and a brain fart or two. Or maybe that's just me. ...as if there is no nuance or uncertainty in the world. We treat bipolar disorder in people, but seem to tolerate it and even promote it in society. Arguments quickly move to the extremes, becoming ludicrously over-simplified in the process. Example: we need to have an even-tempered, fact-based discussion about our exploitation of oil and gas, especially in places like the oil sands. This discussion is difficult to have because if you're not with 'em, you're against 'em. ...as if nature is just a good citizen of science. Without wanting to fall into the abyss of epistemology here, I think it's important to know at all times that scientists are trying to describe and represent nature. Thinking that nature is following the laws that we derive on this quest seems to me to encourage an unrealistically deterministic view of the world, and smacks of hubris. How vivid is the claret, pressing its existence into the consciousness that watches it! If our small minds, for some convenience, divide this glass of wine, this universe, into parts — physics, biology, geology, astronomy, psychology, and so on — remember that Nature does not know it! ...as if knowledge consists of static and fundamental facts. It's that hubris again: our diamond-hard logic and 1024-node clusters are exposing true reality. A good argument with a pseudoscientist always convinces me of this. But it's rubbish—science isn't true. It's probably about right. It works most of the time. It's directionally true, and that's the way you want to be going. Just don't think there's a True Pole at the end of your journey. There are probably more but I read or hear and example of at least one of these a week. I think these fallacies are a class of cognitive bias peculiar to scientists. A kind of over-endowment of truth. Or perhaps they are examples of a rich medley of biases, each of us with our own recipe. Once you know your recipe and learned its smell, be on your guard! Is your brilliant idea really that valuable? At Agile*, we don't really place a lot of emphasis on ideas. Ideas are abundant, ideas are cheap. Ideas mean nothing without actions. And it's impossible to act on every one. Funny though, I seem to get enthralled whenever I come up with a new idea. It's conflicting because, it seems to me at least, a person with ideas is more valuable, and more interesting, than one without. Perhaps it takes a person who is rich with ideas to be able to execute. Execution and delivery is rare, and valuable. Kevin Kelly describes the evolution of technology as a progression of the inevitable, quoting examples such as the lightbulb, and calculus. Throughout history parallel invention is the norm. We can say, the likelihood that the lightbulb will stick is 100 percent. The likelihood Edison's was the adopted bulb is, well, one in 10,000. Furthermore, each stage of the incarnation can recruit new people. Those toiling at the later stages may not have been among the early pioneers. Given the magnitude of the deduction, it is improbable that the first person to make an invention stick was also the first person to think of the idea. Danny Hillis, founder of Applied Minds describes this as an inverted pyramid of invention. It tells us that your brilliant idea will have coparents. Even though the final design of the first marketable lightbulb could not have been anticipated by anyone, the concept itself was inevitable. All ideas start out abstract and become more specific toward their eventual execution. Does this mean that it takes 10,000 independant tinkerers to bring about an innovation? We aren't all working on the same problems at the same time, and some ideas arrive too early. 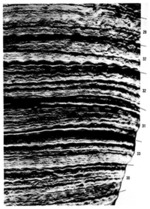 One example is how microseismic monitoring of reservoir stimulation has exploded recently with the commercialization of shale gas projects in North America. The technology came from earthquake detection methods and that has been around for decades. Only recently has this idea been utilized in the petroleum industry, due to an alignment of compelling market forces. So is innovation merely a numbers game? Is 10,000 a critical mass that must be exceeded to bring about a single change? If so, the image of the lonely hero-inventor-genius, then, is misguided. And if it is a numbers game, then subsurface oil and gas technology could be seriously challenged. The SPE has nearly 100,000 members world wide, compared to our beloved SEG, which has a mere 6,000 33,000. Membership to a club or professional society does not equate to contribution, but if this figure is correct, I doubt our industry has the sustained man power to feed this funnel. This system has been observed since the start of recorded science. The pace of invention is accelerating with population and knowledge growth. Additionally, even though the pace of technology is accelerating, so is specialization and diversification, which means we have fewer people working on more problems. Is knowledge sharing and crowd wisdom a natural supplement to this historical phenomenon? Are we augmenting this funnel or connecting disparate funnels when we embrace openess? A crowded funnel might be compulsory for advacement and progression even if it is causes cutthroat competitiveness, hoarding, or dropping out altogether. But if these options become no longer palatable for the future of our industry, we will have to modify our approach. Today is a historic day for greatness: Rene Descartes was born exactly 415 years ago, and Isaac Newton died 284 years ago. They both contributed to our understanding of physical phenomena and the natural world and, while not exactly geophysicists, they changed how scientists think about waves in general, and light in particular. Scientists of the day recognized two types of colour. Apparent colours were those seen in prisms and rainbows, where light itself was refracted into colours. Real colours, on the other hand, were a property of bodies, disclosed by light but not produced by that light. Descartes studied refraction in raindrops and helped propagate Snell’s law in his 1637 paper, Dioptrica. His work severed this apparent–real dichotomy: all colours are apparent, and the colour of an object depends on the light you shine on it. Newton began to work seriously with crystalline prisms around 1666. He was the first to demonstrate that white light is a scrambled superposition of wavelengths; a visual cacophony of information. Not only does a ray bend in relation to the wave speed of the material it is entering (read the post on Snellius), but Newton made one more connection. The intrinsic wave speed of the material, in turn depends on the frequency of the wave. This phenomenon is known as dispersion; different frequency components are slowed by different amounts, angling onto different paths. What does all this mean for seismic data? Seismic pulses, which strut and fret through the earth, reflecting and transmitting through its myriad contrasts, make for a more complicated type of prism-dispersion experiment. Compared to visible light, the effects of dispersion are subtle, negligible even, in the seismic band 2–200 Hz. However, we may measure a rock to have a wave speed of 3000 m/s at 50 Hz, and 3500 m/s at 20 kHz (logging frequencies), and 4000 m/s at 10 MHz (core laboratory frequencies). On one hand, this should be incredibly disconcerting for subsurface scientists: it keeps us from bridging the integration gap empirically. It is also a reason why geophysicists get away with haphazardly stretching and squeezing travel time measurements taken at different scales to tie wells to seismic. Is dispersion the interpreters’ fudge-factor when our multi-scale data don’t corroborate? ...so much of classical seismology and wave theory is nondispersive: basic theory of P and S waves, Rayleigh waves in a half-space, geometric spreading, reflection and transmission coefficients, head waves, etc. Yet when we look at real data, strong dispersion abounds. The development of spectral decomposition has served to highlight this fact. We should think about studying dispersion more, not just as a nuisance for what is lost (as it has been traditionally viewed), but as a colourful, scale-dependant property of the earth whose stories we seek to hear.